Sometimes you only have access to e-mail but you want to post something to the Activity stream via e-mail or share someone’s e-mail message with everyone. 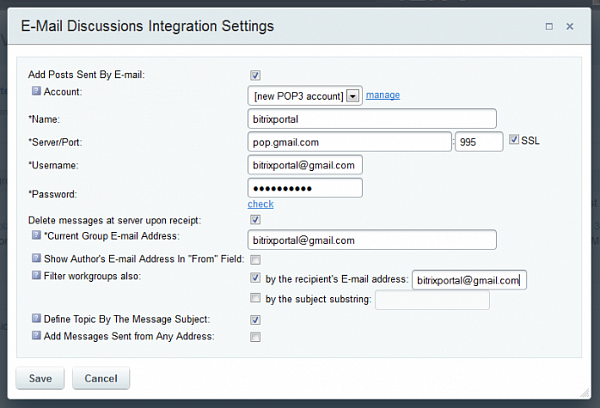 Or you may want to automatically feed all incoming e-mails sent to a specific address (sales@yourdomain.com or helpdesk@yourcompany.com) into a specific Bitrix24 workgroup (Sales Leads or HelpDesk in this example). Bitrix24 Send&Save technology lets you do that, if you use the self-hosted version of our software (for the cloud version Send&Save works in the CRM). 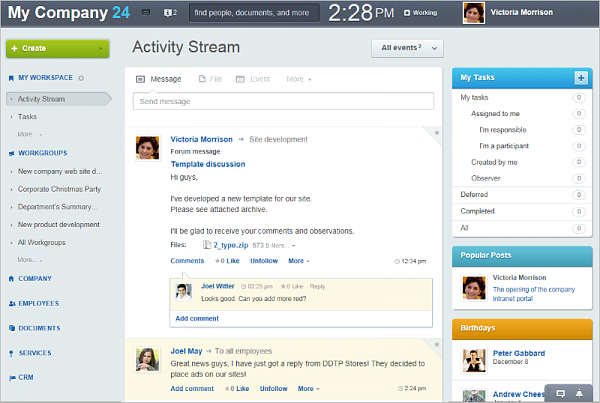 This is how posting e-mails to Activity Stream works. First, you go do the Workgoup where you want to use the Send&Save feature and go to Discussions in order to set up the workgroup e-mail address. You can use either your corporate mailbox or free e-mail services (Gmail, Yahoo!Mail, Hotmail, Outlook.com) for that, as long as you are able to get information about POP3 server and password. As you can see, there are several filtering options that let you customize your Send&Save setup. 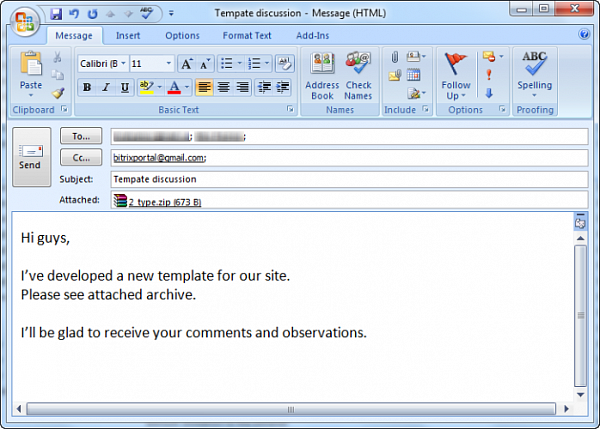 You can either post e-mails to workgroups based on what e-mail address they were sent to, or you can use a single e-mail address and the e-mail subject will be used as a filter that determines which workgroup the message will be posted to. 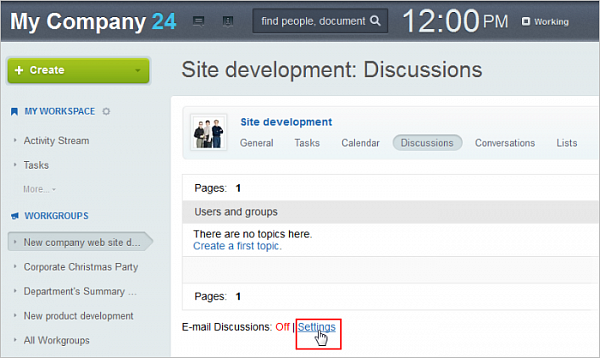 Because all discussions and posts are indexed by Bitrix24, you can now use your portal search to locate e-mail messages that were sent by your co-workers or clients. Let’s say you have 20 sales people, each of whom uses his or her own corporate e-mail account. When someone leaves, the admin closes that account down and none of the remaining 19 sales representatives has access to old e-mails received by the employee that left. Each time someone needs to look up information contained in those old e-mails, the admin has to be contacted in order to login into that account, get into the inbox, and then search for the right message. And if the employee that left used his or her personal e-mail address for any communications, that data is lost to company. Setting up Send&Save for workgroups solves the problem. 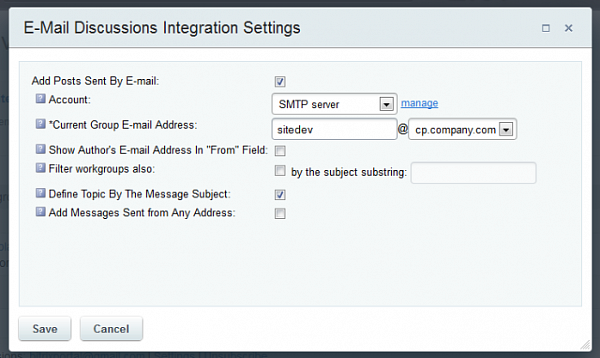 It’s likely that you’ll want to use your corporate mail server for integrating e-mails into your Activity Stream. These are the steps that need to be followed (to repeat, you must have the self-hosted version of Bitrix24 in order to be able to do that as the cloud version does not offer Send&Save outside the CRM). 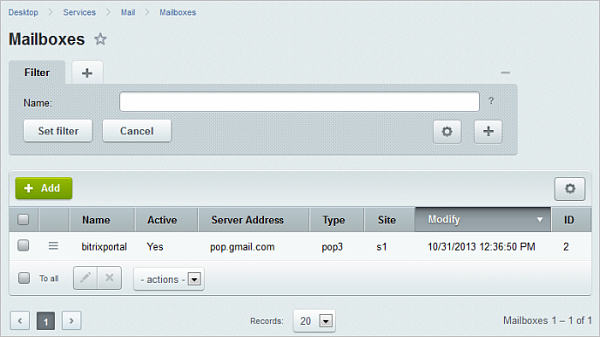 First, using a built-in SMTP server, go to the Mail module and add a new mailbox that will be used for Send&Save. Here, you see a record with data about the POP3 mailbox mentioned above. 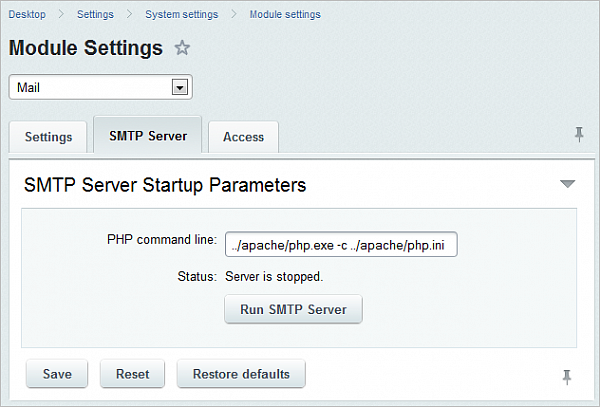 It was automatically created when the settings were configured in the workgroup. 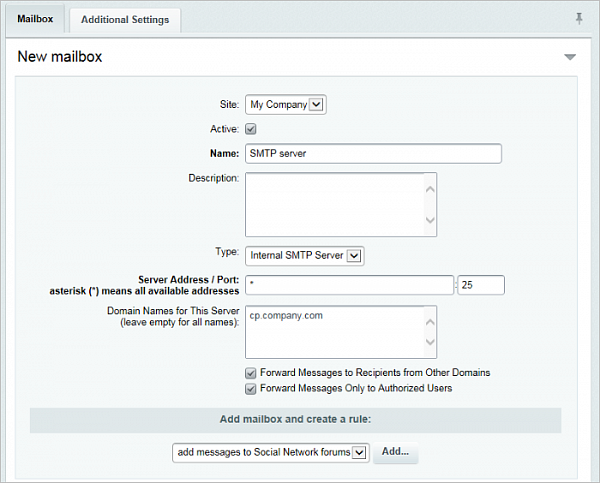 Let’s create a new mailbox using the Internal SMTP server, and use an address with the company domain. After this, the server in the Mail module settings should be started. To do this, a pre-configured MX record is needed. If the server doesn’t launch, consult your system administrator. Now, in the settings of the discussion section, we can put in our new mailbox to serve as the mail archive. After saving, letters sent to sitedev@cp.company.com will be added to the discussions of workgroups, as in the previous example. IMPORTANT! 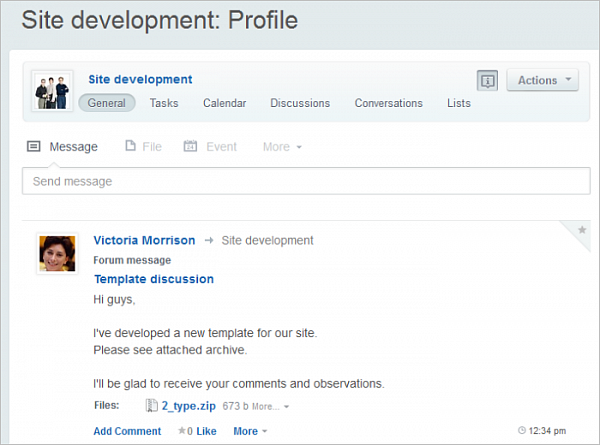 While you may use Send&Save to post e-mails to different intranet workgroups, when someone replies or comments to your message in the activity stream, you will NOT receive e-mails with the replies. 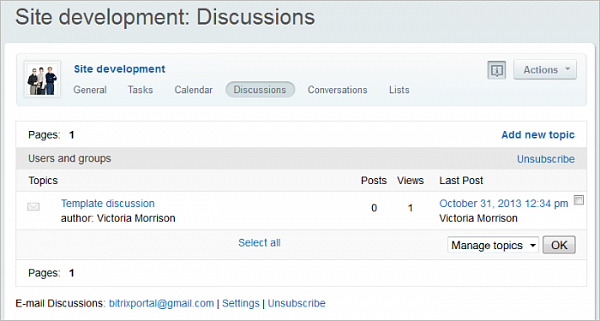 You can, however, subscribe to Discussions to receive notifications when someone replies to your topic there.